You are here: Home / Budgets and Bills / Is Homebrewing Frugal? 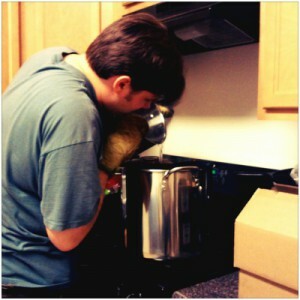 We started a new hobby this week – homebrewing. We were looking for a productive hobby that both of us could enjoy together. Since my husband works in software development and I’m an online content manager, homebrewing offers us an activity that allowed us to try something different than our regular day to day routine. There are many reason people make their beer; one of them being costs. Some people find that homebrewing is a frugal option that allows them to enjoy craft beer at a fraction of the price that it is typically sold for at stores and pubs. We went to American Brew Masters, a local brew supply shop right here in Raleigh. They had everything that we needed and suggested a more affordable setup than one that we had seen online. They figured that we should try it out a few times and then decide if want to upgrade later. Since their prices were very reasonable should we need to grab some more equipment, we took their advice. 2 6.5 gallon heavy duty fermenters with drilled and gasketed lid. We made our first batch last night. In addition to equipment that comes with this set up, we also got a second recipe kit for brew day. With everything included the total came out to $230. Is this cheap? No, but with every batch that we make the cost per use will decrease. Perhaps you don’t want to jump all in and put that much money down. There is another option that may work well for your budget. I also got a small all grain equipment kit from Brooklyn Brewshop that allowed us to get started last night. It’s $40 (free shipping with my amazon Prime account) and the kit includes most of what we needed for the brew, with the exception of 4 chestnuts, a funnel, strainer, honey, and a brewpot. We had picked up a funnel and strainer at the store and had the pot and the honey already at home. Alas chestnuts were nowhere to be found. The kit is usable so you can simply order another mix bag from them or you can go to your local brew supply shop and assemble your own ingredients. I think it’s an affordable to get started and it is easy to prepare. Got Any Tips on Homebrewing? Now it’s just the waiting game with our first batch as it’s fermenting right now. I will definitely write something up when it’s bottled and ready to drink. We’d love to get your tips and stories if you have home-brewed in the past or are brewing now.